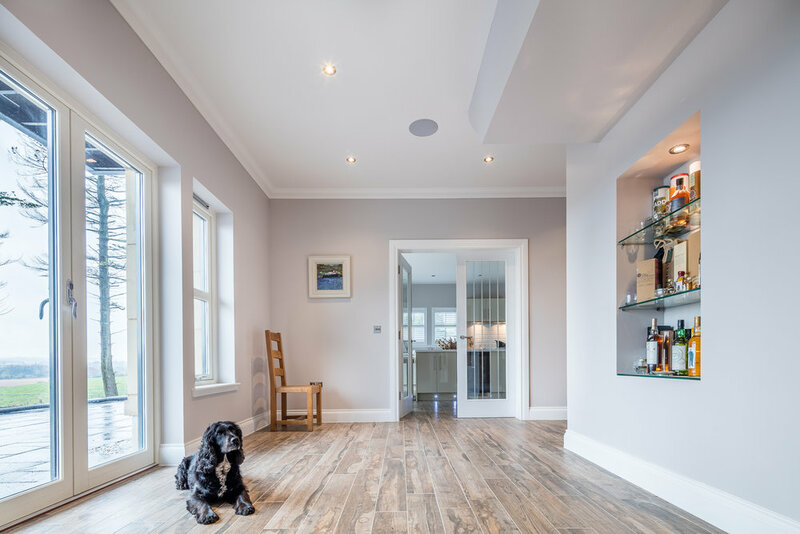 For these dog lovers, Underfloor Heating made perfect sense in their self build project in Larbert, Scotland. 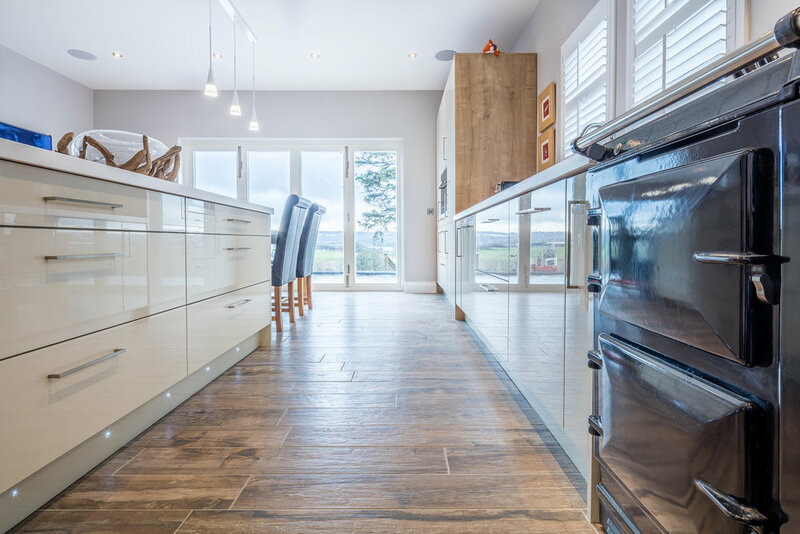 With large glazed areas overlooking the picturesque Forth Valley, Underfloor Heating was particularly appropriate, the floor turning into a large scale heat emitter more than compensating for the loss of wall space. Interior space planning becomes a doddle when there are no obstructions on the walls. The homeowners wanted the look of a timber floor in their hallway but didn’t want their home feeling too ‘woody’- and were delighted when they found ceramic tiles that looked exactly like wood! Now they combine the attraction of a timber floor with the hardwearing practicality of a ceramic floor- and the dog enjoys it too! Each zone is controlled by a dedicated programmable thermostat. This ensures that the rooms are always warm during the occupied periods, and are set back by a few degrees when the homeowners are away. Realistically it is unlikely that a modern well insulated house would lose 4⁰C over the course of a day, but if it ever did (remember the winters of ‘09 and ‘10?) the heating would automatically kick in. On the upper floor radiators were installed. These are connected to a manifold so that each room can be independently (and accurately) controlled for time and temperature. Let’s face it, thermostatic radiator valves were good and a giant leap forward when they first came out in the 1970’s. Unfortunately, as most homeowners now appreciate, the timeclock will always bring the boiler on, regardless of whether heat is required or not. Now with our system the boiler will only be activated if there is a need for it. Not everyone enjoys thermostat programming or even understands how to use them, so there was a certain amount of trepidation when we started to demonstrate how to use the Underfloor Heating controls. However, once we got started and downloaded the NEO app onto the homeowners’ tablet, all those worries evaporated. Earlier networkable systems required a computer technician or a six year old to set up, not with this system! Whilst the system will work from anywhere in the world whilst you have an internet connection, and arguably this is what it was designed for, it is also just as easy to increase the temperature of the upstairs bathroom whilst lounging in front of the TV downstairs.